LANSING, Mich. — This week state Sen. Mike Shirkey and Rep. Earl Poleski joined local cub scouts to thank them for their part in bringing awareness to Pollinator Week in Michigan, which lasts June 20 – 26. Cub Scout Pack 440 from Paragon Charter Academy recently brought attention to pollinator issues through their involvement in the Rose Parade, where they won the grand champion prize for their beehive-designed float. The float was made of 852 roses, put together by the Jackson area children and parents of Pack 440. The cub scouts’ activities are closely related to the pollinator resolution recently adopted by the senate. Senate Resolution 189 recognizes a week in June as a time to highlight the importance of pollinators, reverse the trend of their decline, and encourage good stewardship practices of the species that pollinate the food we consume in Michigan. Honey bee colonies in Michigan are one of the valuable resources we have, and they are a key part of ensuring the state’s continued food security. The number of managed honey bee colonies in the United States used for honey production has decreased in recent decades, from around 4 million colonies through the 1980s to about 2.75 million today. This means projects by groups like these cub scouts are increasingly important for sharing knowledge about responsible management of the state’s pollinators. If you know about other efforts in Branch, Hillsdale or Jackson counties to bring pollinator issues to light, you can let Sen. Shirkey know by emailing MikeShirkey@senate.mi.gov or by calling 517-373-5932. Editor’s note: Click the image for a print-quality version. This photo and others are also available by clicking the Photowire link. 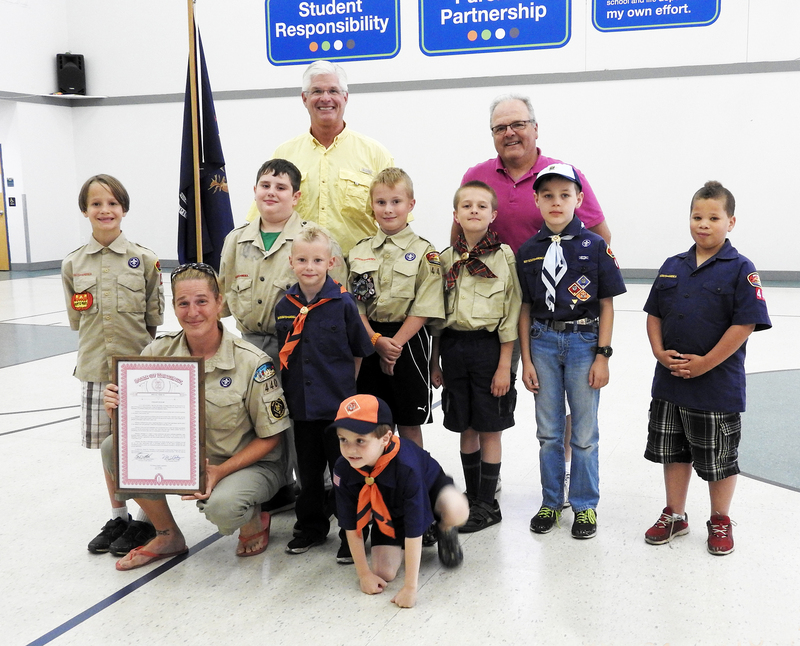 Photo caption: State Sen. Mike Shirkey, R-Clarklake (yellow shirt) and Rep. Earl Poleski (pink shirt) joined local cub scouts from Cub Scout Pack 440 and Chairman and Bear Den Leader Crystal Jones to thank them for their part in bringing awareness to Pollinator Week in Michigan, which lasts June 20 – 26.